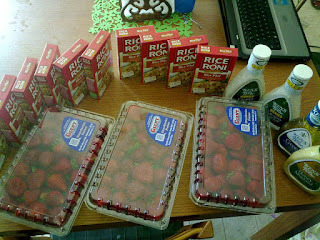 This Week wasn't full of shopping, but I managed to spend a huge amount due to Costco and a bulk honey purchase. I went to Albertson's to score the 3# strawberries for $3.88. At $1.29/lb this is the cheapest I've seen anywhere all year so far. I bought 7 pounds a couple weeks ago with jam in mind, but my family ate all of them. So I'm buying again, hoping for jam. I spent $20.60. Rice-a-roni on sale for $.50 each if you Buy 10. Next stop was Costco. I recently renewed my membership after a 3 year hiatus. Truly, some things are just cheaper there and while I can get as good a price at my local grocery stores if I shop sales and use coupons, it's more convenient not have to wait for the sale for 3 months or print/clip coupons. I spent $ 40.23. I also bought 2 pepperoni pizzas for $5.99 each that were $12.90 total. Not sure why unbaked pizza had tax? My bulk buying group has raw honey coming in about a month. I placed an order for 6 quarts and paid $77.50.